Several years ago, when we first started up this here blog, we were having issues with any whisky that came from a distillery whose name began with the letter “T”. If my memory serves me correctly, I believe it was a Tamdhu (we called it “Tam-don’t”) and a Tomintoul that soured our palate. And then there was the case of the Tullamore Dew (we called it “Tullamore Don’t”), which had less to do (or should I say Dew?) with the actual whisky, and more to do (Dew?) with consuming large quantities of it in a very short period of time. These not so happy experiences resulted in us avoiding any “whisky with a T” for quite awhile. In retrospect, our logic was beyond flawed. It made absolutely no sense! You see, according to the Malt Madness website, there are currently 9 distilleries in Scotland that begin with a “T”. Avoiding all “whiskies with a T” would mean that I can never again have a Talisker (I adore Talisker!). And then I would also have to avoid Tamnavulin, Teaninich, Tobermory, Tormore, and Tullibardine. Sticking to this rule would also mean that I shouldn’t be writing up this review which is about a single cask bottling of a 2004 Tomatin from The Exclusive Malts. The moral of the story is that when it comes to whisky, don’t overthink it, i.e. judge a whisky on its own merits and don’t make broad generalizations based upon some stupid rule that you may or may not have made up while in a drunken stupor. Aroma: Surprisingly little alcohol burn when I take that first sniff. The Sherry influence is front and center with lots of musty grapes, dried fruit, and baking spice notes. Also getting some dark brown sugar, cinnamon, clove, and the slightest hint of dark chocolate or unsweetened cocoa powder at the very end. Taste: The mouthfeel is a touch on the oily side. At the start, it doesn’t start off as sweet and fruity as I was expecting. As you approach the middle, it heats up really quick with an intense chile pepper and cinnamon spiciness. The sweetness comes back at the finish, and the aftertaste is quite astringent. 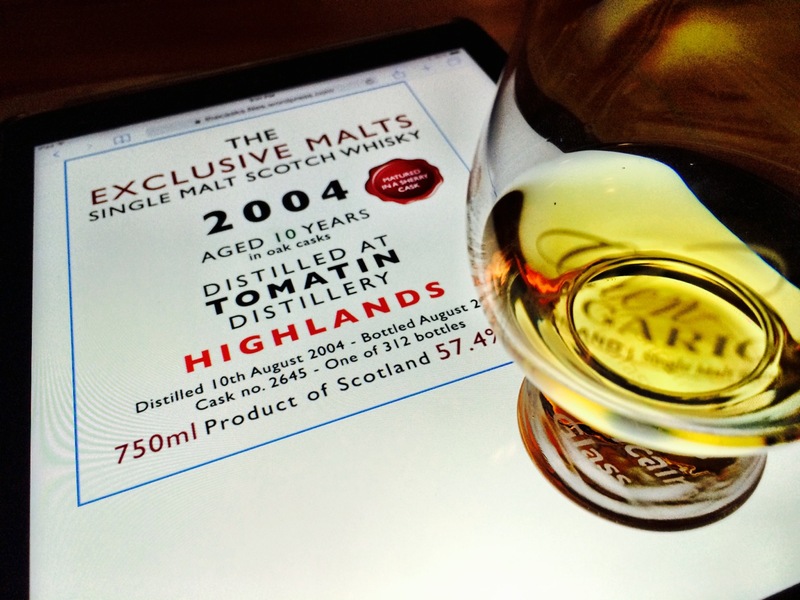 The 2004 Tomatin is all about the nose which I found to be quite interesting and multifaceted. The taste is good, but not super compelling since I found that the mid-palate heat was a touch overbearing, i.e. it totally drowned out the subtleties that I picked up in the nose. I liked this whisky, but I didn’t love it. For a completely different perspective on this whisky, head on over to The Casks. Further proof that everyone tastes and smells things differently! Many thanks to the good people at Impex Beverages for the opportunity to taste this whisky! Wow, we really did have quite different takes on this one! How did it do with water? Didn’t get to try it with water. Always forget to do that.